Mimecast, the Boston-area company specializing in email and data security, recently moved their Watertown office to a new space in Lexington, MA and called us at Ideal Office Solutions to help make the design transitions they had in mind for their new office. The Lexington MA space, measuring at 79,000 square feet, doubles the size of their previous office, giving us plenty of room to work with and countless possibilities. Follow along to learn more about how we helped our friends at Mimecast grow into their new space with a brand new look! We worked alongside Mimecast to plan their office considering the various uses of the space, as the building includes various offices, conference rooms, break/relaxation rooms, dining areas, a gym, and even a roof deck. Take a look at the photos below to get an insight into Mimecast's impressive new space. This casual space provides a place for Mimecast employees to wind down, relax and play a quick game of pool! With a constantly growing staff, Mimecast made it a priority to have several open spaces with plenty of seating to be sure there is always room for everyone. 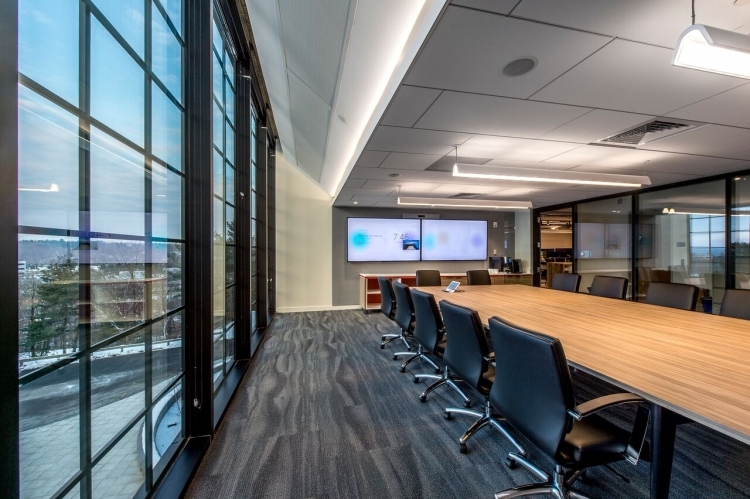 Glass walls and doors allow this conference room to be an open space while maintaining privacy and avoiding disrupting the rest of the floor. With teams of varying sizes, we found it crucial to include spaces for smaller teams to meet and communicate privately while not needing to take up an entire conference room. Mimecast maintained that they wanted a balance of designated work and relaxation areas. This area provides a closeby break from employees' desk spaces. This large conference room offers a more open space than most, making an ideal area for presentations and other interactive meetings. With two large screens, there are countless uses for this room! At Ideal Office Solutions based in Methuen MA, we offer a range of office furniture services including new, used, and refurbished furniture, office design, delivery & installation, project management, office furniture liquidation, and much more. Contact us today for a free quote on any of our services!